The sincerest form of flattery? Our 2013 Copy-Stealin’ Roundup! | Rewatchable, Inc. The sincerest form of flattery? Our 2013 Copy-Stealin’ Roundup! It’s that time of year again – refreshing the website, putting a new spin on old copy, and having some fun with the plagiarists! 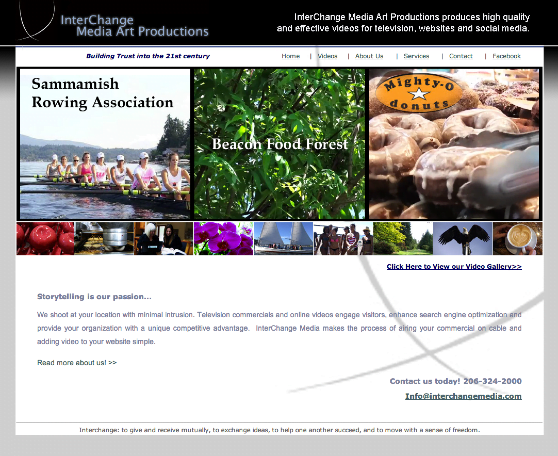 Online videos engage visitors, enhance search engine optimization, and provide your organization with a unique competitive advantage over competitors with ‘flat’ websites. Rewatchable makes the video production process simple by shooting at your location using state-of-the-art gear and content-focused techniques, all without sacrificing amazing production values or your corporate message. Very nice use of our copy. At the top, they’ve taken our header, “Rewatchable specializes in high quality, effective videos…” and replaced the comma with an ‘and’. Of course, I used the comma so I could cobble in the search engine optimized term immediately afterwards, but not bad. Then we get down into the bottom. ‘Storytelling is our passion…’, but apparently, the following paragraph didn’t incite enough passion to tell their own story – that sucker’s lifted word for word. Okay, I’ve gotta start out with the navigation. Rewatchable’s ‘Get Started’ page got horrible engagement, was a mistake, and I got rid of it in 2012. 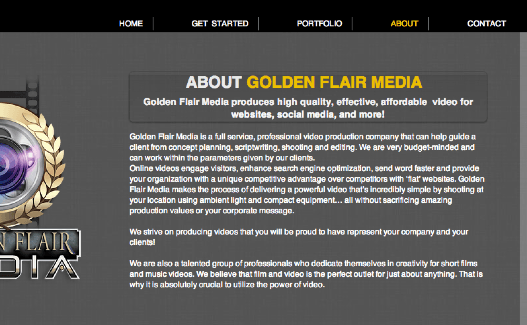 So what’s up Golden Flair Media? If you’re going to steal copy, you need to KEEP UP THE PACE. I will, however, award bonus points for integrating copy from multiple Rewatchable pages into your homepage. But I’m going to take those bonus points away because the two lines you actually wrote yourselves, ‘We strive on producing videos that you will be proud…’ and ‘We are also a talented group of professionals who dedicate themselves in creativity for short…’ are littered with atrocious grammatical errors. Come on, talk gooder than that! Your clients is depending in you! This one just kind of ticks me off, because immediately following the ripped-off copy? A page full of perfectly decent copy! Now, while it’s entirely possible they just stole the other paragraph and bulleted list of features from another business, this just reeks of laziness. Script Media, your mother and I aren’t so much angry with you as we are disappointed. We’d like to see what you can come up with if you actually apply yourself. 2KN Media? I’m giving you a pass here, because you’ve got big blue text saying, ‘Show. Don’t Tell.’ If you’re not in the telling business, then I’m perfectly comfortable with your stealing my copy. 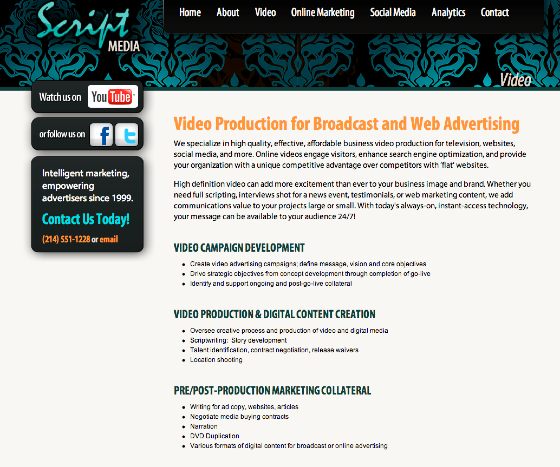 But, apparently you’re not in the showing business either, because I can’t find a single stinkin’ video on your site. And you’re from Boston? You’re plagiarizing your neighbors?!? Wicked lame, dude. Wicked lame. JIMINY CRICKETS! Holy crap! Yikes! 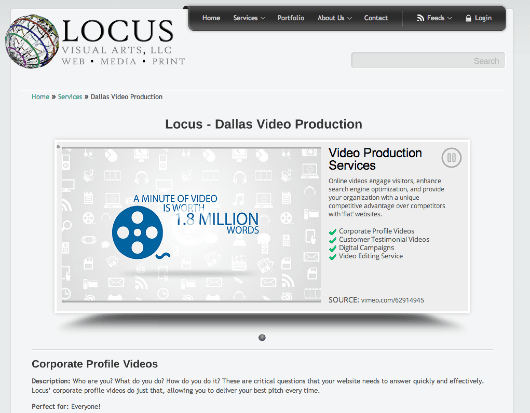 Dallas-based Locus Visual Arts has taken copy-theft to stellar new heights! These folks didn’t just stop at the home-page. See the video to the left? That’s from an ANCIENT thing I wrote about how if a picture is worth a thousand words, and there are 60 seconds in a minute, and 30 frames per second, a minute of video is worth 1.8 million words. It was an incredibly convoluted idea, got zero traction, and I abandoned it as part of our marketing… in 2011. They used it IN AN ANIMATED VIDEO. We don’t even shoot at 30FPS anymore, and haven’t for years. Then we’ve got the standard copy-rip about ‘engaging visitors, etc’, but then if you keep scrolling down below, they’ve pulled copy from subpages. Lots of subpages. A scary number of subpages. I think I probably wrote about 99.9% of the copy on their site! Be sure to click on ‘The Process’ at the bottom – I’m removing that page from Rewatchable.com this month, so it’ll soon be a Locus Visual Arts ‘exclusive’. Ever have your marketing copy, well, uh, copied? Tell us about it in the Comments!